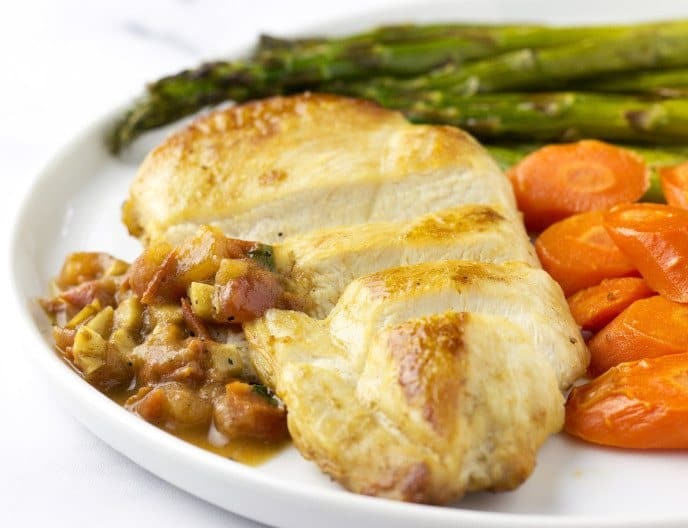 This chicken scaloppine recipe features tomato butter sauce paired with roasted carrots and asparagus. Scaloppine is an Italian word which means thin meat. In this recipe, we’ll be pounding the chicken breast to even the thickness of the chicken. This is an easy dish to prepare perfect for weeknight dinners. Not only is it delicious but also a healthy meal which can be prepared in just over 30 minutes. Get ready and grab your knife and mallet. Let’s get cooking! What Makes A Good Pan Fried Chicken Scaloppine? A good chicken scaloppine is a combination of moist and tender chicken breast complemented with a delicious garnish sauce. It starts with the meat. Chicken breast must be perfectly fried without drying the meat. This should only take a few minutes of frying on each side that gives you an incredible chicken breast that melts in your mouth. A good sauce will add color and flavor to an already perfectly seasoned chicken breast. The sauce that we will be making will do just that. Pair this with baked vegetables and you’ve got yourself a tasty and healthy meal everyone can enjoy. It is important that you get yourself a good quality boneless chicken breast. I prefer organic chicken as it is healthier with fewer preservatives. The pounding of the chicken breast is an essential step as it evens the thickness of the chicken making it easy to cook. I placed the chicken breast in a zip lock bag and pounded it with a mallet. If you don’t have a mallet then use a small pan to pound the chicken. Get the thickness of the chicken to about 1/4 inch. Only fry the chicken with a medium heated pan. This heat is enough to brown the chicken on the outside and cooking the inside to a perfectly moist and tender meat. This should only take a few minutes on each side. The garnish sauce for this recipe is easy and quick to make. The whole process should take no more than 2 minutes. Sauteeing the garlic should only take about 30 seconds. Completing the sauce requires adding white wine which boils rapidly. Let it boil until it is almost evaporated. Remember to quickly turn off the burner before you start adding the rest of the ingredients. You can either spread the sauce on top of the chicken breast or place on the side. 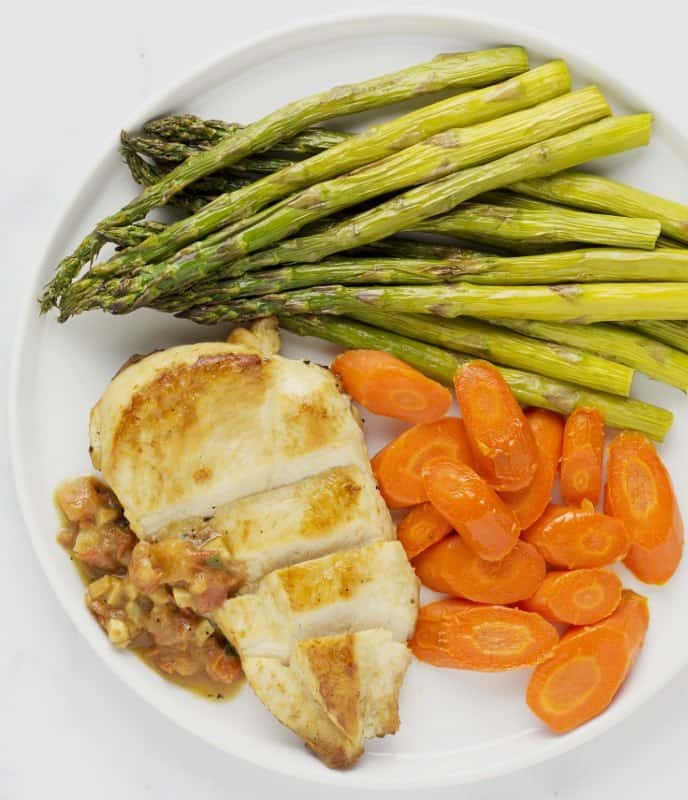 Lastly, I paired the chicken scaloppine with roasted asparagus and carrots. They were lightly seasoned with salt and olive oil. You can also pair the dish with broccoli, mushrooms, or whatever vegetables you have that is good for roasting. Now take a look at that chicken deliciousness! 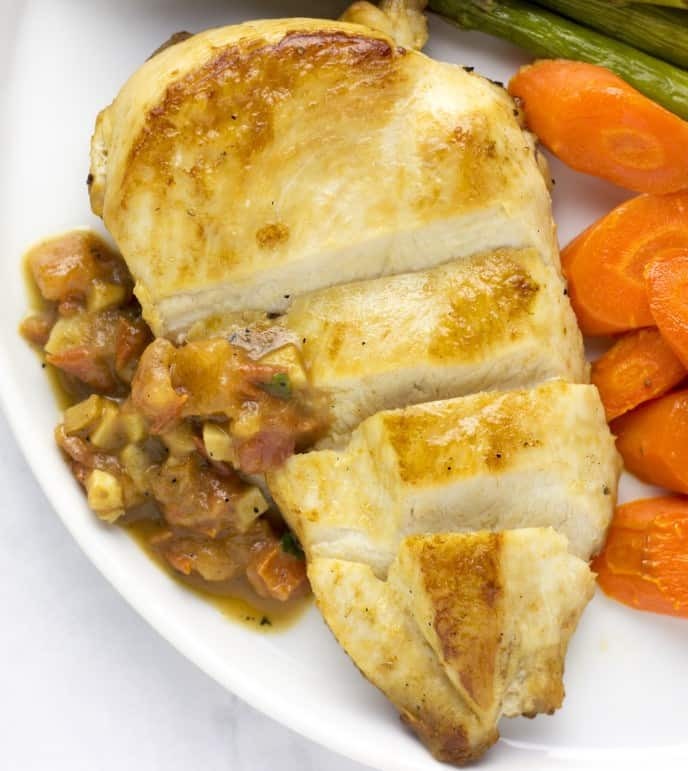 Simple dinner recipe perfect for busy weeknights with this chicken scaloppine with roasted vegetables. Peel carrots and slice into 1/4 inch pieces. Trim asparagus. Set sliced carrots and asparagus on a baking pan. Season vegetables with a pinch of salt and 1 tsp of olive oil. Roast for 20 minutes. Pound chicken breast with a mallet until it is close to even thickness. Lightly season chicken breast with salt and pepper. On a medium heated pan add 2 tsp of olive oil. Pan fry chicken breast for about 3-5 minutes each side until meat temperature reaches 165F. Mince garlic and parsley. Core and diced tomato. On the same medium heated pan, add 1 tsp of olive oil and cook garlic until golden brown. Add white wine and let it boil for 1 minute. Turn off the burner and add butter, minced parsley, and diced tomato. Add a pinch of salt. Plate chicken and roasted vegetables. Garnish chicken with white wine sauce.